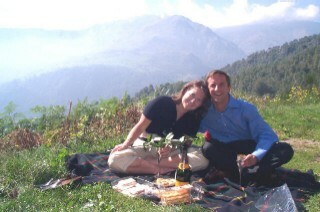 Mike decided to surprise Kristen by taking her to his hometown of Biella, Italy to propose. The span of events occurred between September 14th through September 17th. To make this happen, he coordinated this effort through several key groups � her managers, her parents and his parents. First, since Mike needed Kristen out of work on September 16 and 17th for the trip, he contacted two of her managers. One of her managers gave her two vacation days to take at her discretion, but she had to use them by the end of September. Since Kristen was not agreeing with Mike on what two days to take off, Mike got her managers to clear her schedule for these two days with fictitious meetings. Then Mike asked Kristen�s parents for her hand in marriage on September 12th and celebrated with them (via champagne, fruit, and cheese). During this time, Kristen thought Mike was out having dinner and drinks with a friend in the east bay. The following night (September 13th), Kristen and Mike had dinner with her parents celebrating her mom�s birthday. Since Mike had not told Kristen that she would be getting on a plane the following morning, he had to make up a reason why she was going. On this day (i.e., 9/13), Kristen was receiving congratulatory messages for her 3rd year with her company. Kristen told Mike� Mike got an idea. After Kristen had told Mike of the calls, he created a card with the company�s logo and the card was congratulating Kristen�s 3rd year anniversary. Within the card, there was a separate piece of paper detailing a �gift� from the company for this anniversary � i.e., a free trip to an �unknown� destination. All she knew was that there could be rain, she should bring some good walking shoes, and a passport was needed. Kristen was in disbelief on receiving a gift such as this, but she had nothing else to go on to not believe the trip. On the way home from dinner, Kristen pestered Mike on disclosing the location of the trip. He would not tell. She ended up searching the CNN weather website and looked at flight schedules on United and American to figure out this destination. She almost called the airlines to figure out her itinerary but decided not to call. From this research, Kristen thought that they were going to Banff, Canada for the vacation. It was not until the next morning when Mike and Kristen arrived at the American check-in desk when Kristen realized that they were not going to Canada. The agent asked �how many bags are you going to check-in for Milan?� and Kristen knew something was up. She wasn�t sure if her company was still involved with this, but as the day and flights went on � she knew this wasn�t a business trip. Now on the other side of the world, Mike was coordinating with his parents on the details of his and Kristen�s arrival into Biella. They secured a hotel room, dinner reservations, and packed one of their cars with a picnic lunch and a beautiful red rose. They dropped the car off at the hotel waiting for Mike and Kristen�s arrival. Mike and Kristen got into town that Sunday afternoon. After checking in and cleaning up, they decided to go on a drive up to the mountains. It was a beautiful sunny and warm day, so many people were out enjoying the weather. So Mike searched for a quiet location to park. Once they parked, he proposed.